Some time ago I was privileged to be entertained in my own home by Canberra poet, comic performer and creative writing teacher, Harry Laing, who recited a number of his quirky and humorous verse. The man is a natural performer! So it’s wonderful that he has now produced his first collection of children’s verse to accompany him as he tours schools and other venues with his show. 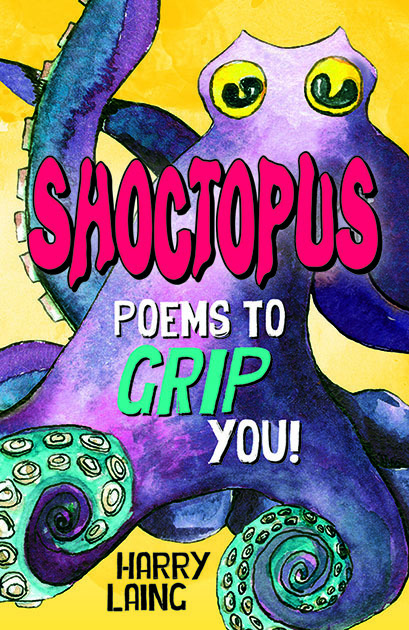 The cover of Shoctopus is bright and appealing and as one flicks through the 95 page book, it’s apparent that much thought has gone into making the book as child-friendly as possible. It’s attractively designed with frequent black and white illustrations. It’s also apparent that the collection has many different topics and poetic styles; dipping into it is a pleasure. Laing has obviously played with words in all of his child-accessible poems. 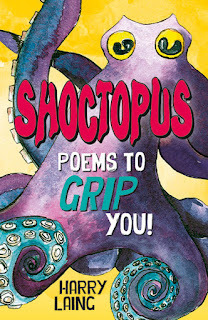 He tells poems from the point of view of a ‘Supertap’, a leech, a worm, and even a wheelie bin. There are raps such as ‘Billy Rap’, limericks, shape poems, a poem that looks like the forest it is about, even life stories (such a ‘Potato Story’), a prose poem and more. Quite a few of the poems are about animals – skink, Pobblebonk frog, a blowie (called Chloe) and an emu; and there are poems from the point of view of objects such as toothbrushes, tyres and trees. A few poems reflect children’s lives; one such poem is ‘It Doesn’t Make Sense’ about a kid falling out of bed. My only quibble about the collections is that it would have been good to have read more child-narrated poems like this one. The main message of Laing’s collection is that this poems in this collection are great for reciting aloud, and they ought to be read. There’s no doubt that they will be popular with most readers, even adult ones.